This SAS and Intel collaborated piece demonstrates the value of modernizing your analytics infrastructure using SAS® software on Intel processing. Benefits of applying a consistent analytic vision across all functions within the organization to make more insight-driven decisions. 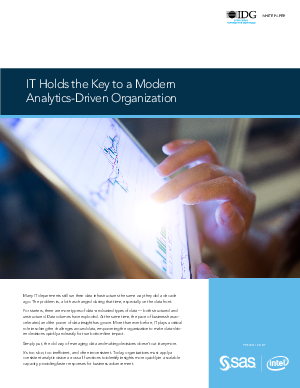 How IT plays a pivotal role in modernizing analytics infrastructures. Competitive advantages of modern analytics.